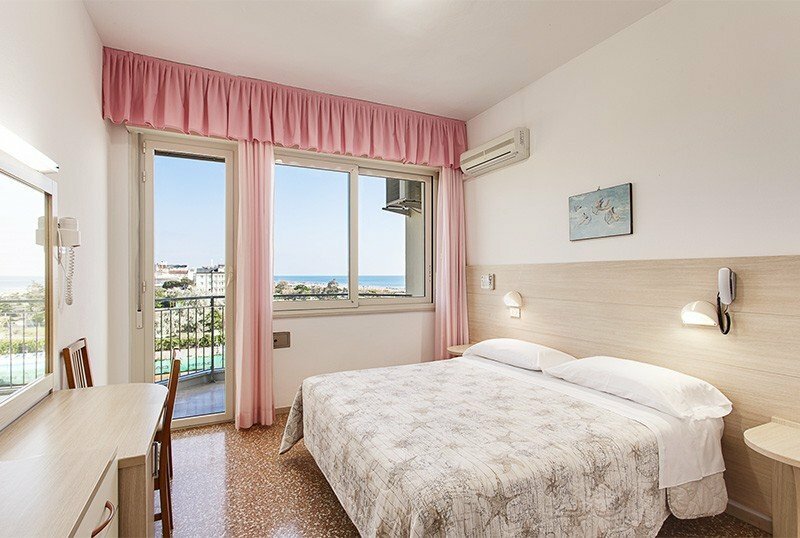 Located on the seafront, the Silver Hotel of Milano Marittima is a 3-star family-run establishment that offers a vacation full of services including free parking, free WI-FI and air conditioning. Small pets are allowed. The hotel is located in Milano Marittima, a stone's throw from the sea in a green and central area. Not far away is the I Maggio roundabout, an area where the main shops, discopubs and trendy bars are located. Recently renovated, they have balconies, many with sea views, air conditioning and heating, WI-FI, satellite TV and digital terrestrial LCD 22 ", safe, telephone and private bathroom with shower and hairdryer. Open-air porch, bicycles available, bar, lift, TV room, reading room, children's playroom. PARKING: uncovered and free, available until exhaustion. AGREEMENTS: beach, amusement parks, gym, spas. BREAKFAST: international sweet and savory buffet. LUNCH AND DINNER: 3 choice menus with traditional recipes from Romagna, fish every day and homemade pasta. Salad and vegetable buffets accompany each meal. In the hotel: indoor playground area. In the room: cot and beds with sides. At meals: seats at the table, entertainment at meal times. The hotel has an agreement with the bathing establishments: Bagno Milano, Bagno Mima, Bagno Roma, Bagno Samuele, La Spiaggetta. These are bathing establishments equipped with sports fields and services for adults and children. Prices are per person per day in a standard double room for a minimum stay. 3 days. TOURIST TAX: not included in the price list, € 1.50 per day per person in the months of June, July, August and € 1.00 in the months of April, May and September for a maximum of 7 consecutive nights, children up to 14 years exempt . FULL BOARD: Buffet breakfast, lunch and / or dinner with choice of menu, water in carafe with meals, bicycles, Wi-Fi. - The booking is always confirmed in writing and following the payment of a deposit of 30% of the total amount or the first night for short stays. - All cancellations and / or changes to the booking must be communicated in writing. Beyond this date and unless otherwise agreed, the value of the deposit will be withheld for damages. Book your escape from the routine now! We are waiting for you in Milano Marittima for Easter. For extra bed € 25.00 extra per day. Possibility to buy discounted tickets for Mirabilandia. Ask us for a personalized quote!